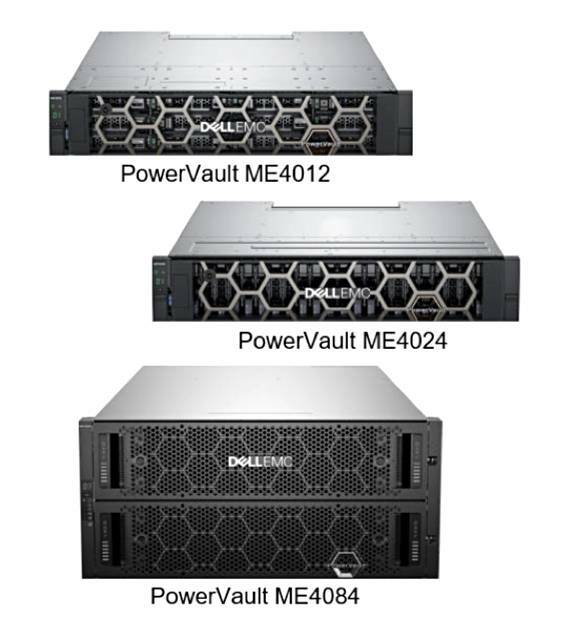 Dell EMC's new PowerVault ME4 Series has been tailored for small and medium businesses – apparently installable in 15 minutes, configurable in 15 more, and usable as either SAN array or direct-attached PowerEdge server storage. Compared to the previous entry-level PowerVault arrays, the ME4 has 75 per cent more drives, 122 per cent higher capacity and a 4X increase in IOPS performance. But it really is entry-level, with no Xeon SP processors, only single and dual Broadwell-DE ones. There are three models – ME4012, ME4024 and ME4084 with 12, 24 and 84 drive slits respectively. The ME4012 takes 3.5-inch drives; the others 2.5-inch ones. The drives can be SSDs or 15K, 10K and nearline 12Gbit/s SAS disk drives, with both all-flash and hybrid configurations supported. Maximum raw capacities are 3.1PB (ME4012), 3PB (ME4024), and 4PB (ME4084). The systems support 10gig iSCSI, 16gig Fibre Channel and 12gig SAS connectivity. There can be three media tiers with auto-tiering, RAID, distributed erasure coding, thin provisioning and snapshots, replication, volume copying, integration with VMware vCenter and SRM, and drive-level encryption. Sizewise the ME4012 and 4024 are 2U boxes while the ME4084 needs a 5U chassis. There is an HTML5 user interface, enabling customers to use a web browser from anywhere to manage the boxes.